Simply First Aid supplies the Mediana HeartOn AED A15 along with a range of defibrillator accessories including prep kits, wall cabinets, bags and wall brackets. 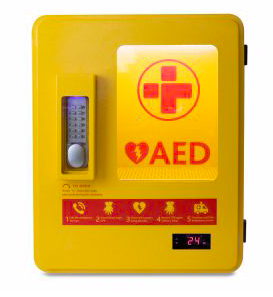 This particular model of defibrillator is perfect for healthcare, school and community settings because of the unique instant switch from Adult to Paediatric AED without the need to change pads. Reasons to choose the Mediana HeartOn AED A15? The unit is supplied with a protective outer cover. When the unit is opened using the easy-slide switch, the machine switches itself on automatically. The defibrillator pads are already connected and ready for use, saving valuable time in a Cardiac Emergency. A combination of LED indicator lights and clearly spoken audible voice prompts, make the AED safe to use even by untrained persons. Visual icons are clearly defined to assist the user, and the clever addition of a switch to flip the machine from Adult to Paediatric mode (or vice-versa), means the pads are suitable for both situations. 1 COVER Protects the icon sheet, shock button, and adult/paediatric mode switch. 2 CONNECTING SOCKET Defibrillator pads connector socket. The pads are always ready to use. 3 SPEAKER Clear audible instructions for real-time guidance. 4 VISUAL ICONS LED indicator lights flash correspondingly with the audible voice prompts. 5 ADULT/PAEDIATRIC SWITCH Easily switch from adult to paediatric mode without changing the pads. 6 IR PORT IR Communication Port between PC and AED. 7 BATTERY Disposable LiMnO2 Non-Rechargeable. 2yrs shelf life, 5yrs standby life. 8 PADS Two-in-One Electrode (Adult/Paediatric). 9 STATUS INDICATOR Unit status, battery level status, and temperature range status. 10 SHOCK BUTTON Flashing button indicates “Ready for shock delivery.” Push the button to deliver shock. 11 OPEN SWITCH Slide the switch to the right to open the cover. Unit automatically turns on. 12 SD CARD INSERT Review stored data and software upgrade.